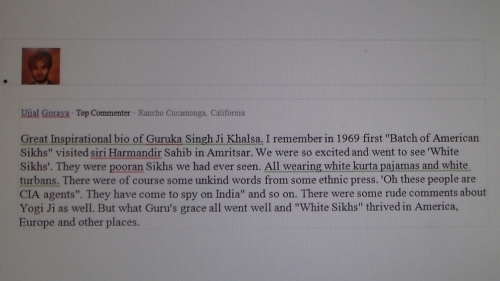 Response to "Guruka Singh: How I Became A Sikh"
When you talk about "....in 1969 first Batch of American Sikhs visited Siri Harmandir Sahib in Amritsar" as being "pooran sikhs", there are some things you don't realize. First of all, for the record, it was 1970-1971, not 1969. Secondly it was all for show. The overwhelming majority of Yogi Bhajan's "pooran sikhs" were wearing turbans only because they had been told by Bhajan Yogi to do so! Yogi Bhajan knew that it would hugely impress the innocent Punjabis who desperately wanted to believe that Bhajan was converting white westerners to Sikhism. Bhajan knew it would cause a sensation and it did. By the time the white westerners left India there were only a handful who were still wearing turbans and today only one, that number is ( 1 ) of those people is still a Sikh. What's so great about that? "Yogi Bhajan's gora Sikhs! The true history behind 1970 Yatra (trip) to India!" 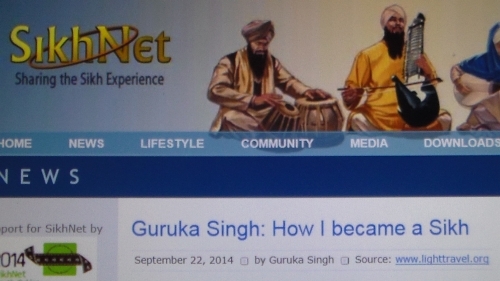 Sikhs are encouraged to write Yogi Bhajan's Sikh Dharma on their fb page at this link and insist they tell the truth and stop propagating a false history of Sikhs & frauds against the Sikh religion.